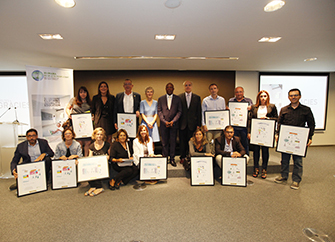 The Foundation today presented in Barcelona of 7th Humana Textile Reuse Awards, under the Humana Day. These awards are a recognition of the support that citizens give the Foundation through donations textile through containers located thanks to agreements with municipalities and private entities. 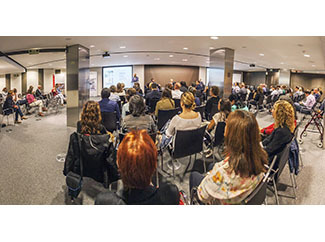 The event was attended as speakers Enric Carrera, UNESCO Chair of Sustainability at the Universitat Politècnica de Catalunya (UPC) and Oscar Ma Matondo Muanda, chargé d'affaires of the Democratic Republic of Congo. The Humana Fundación Pueblo para Pueblo General Director, Elisabeth Molnar, quoted at the beginning of the day Nelson Mandela, who said: "Education is the most powerful weapon in the world." "In this idea we based Humana Day celebration. 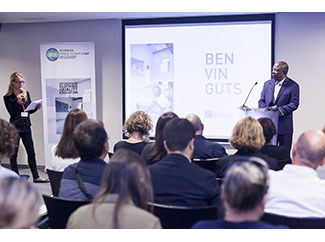 We want to make clear the extreme importance of promoting quality education in countries in the southern hemisphere in which we operate," said Molnar. "We know that investing in quality education, equitable and inclusive generates a direct impact and extremely positive in life and progress of people But this impact should not be measured only from the economic point and generating wealth. Also has implications cultural, social, and important environmental "he added," it is essential to provide basic quality education and give children the skills and knowledge necessary for them to enjoy a full life and are able to meet the challenges ahead". Oscar Matondo highlighted the work carried by Humana in his country in the field of development cooperation and in education. And he set an example of the importance of education: "The age children receive primary education 20% of households poorest are 4 times more likely not to attend school, compared with the richest parents". For his part, Enric Carrera explained that "both academic and non-formal education are indispensable to changing the attitude of people to have the ability to evaluate the issues of sustainable development and address". The teacher insisted that "we must initiate a comprehensive review of the curriculum to establish a multidisciplinary approach encompassing environmental and development issues and their sociocultural and demographic aspects and linkages".